The mortal remains of Edward Alexander, 76, of Colihaut, will be laid to rest on Friday June 7, 2013 following Catholic funeral rites at the Colihaut Catholic Church. The former clergyman, communicator, politician and diplomat died in St Lucia last Tuesday morning May 28, 2013 where he had gone to seek medical treatment. He is survived by his wife 'Patsy' Patricia nee Monelle, sisters Alix James, Amoy Williams, Jacqueline Alexander, Hartie Alexander; and brothers Ignatius and Bernard 'De Rabbit' Alexander, and many other relatives, friends, associates and acquaintances. 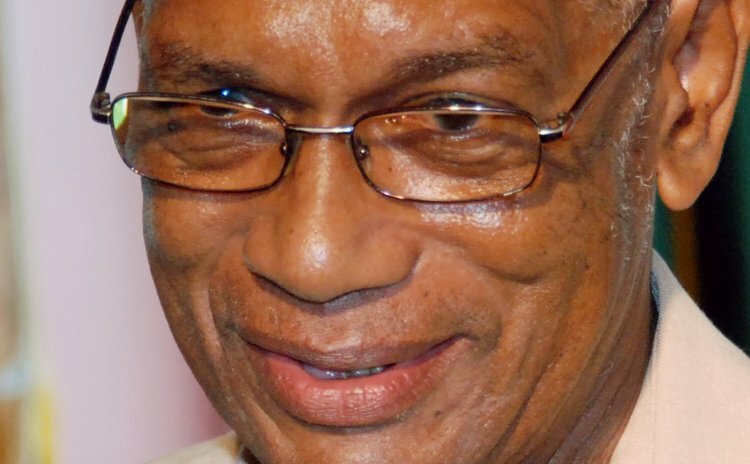 Edward Alexander was born of parents Villa and Maudrey Alexander in Colihaut on February 11, 1937, one of his sisters, Amoy Williams, told The SUN. He attended the Colihaut Government School and the Dominica Grammar School. His first place of work was with Cable & Wireless having studied as a telegraphist in Barbados. From C&W he joined the seminary in France during which he studied theology and philosophy at L'Ecole Superieure de Theologie and the seminary of John Vianney in Trinidad. Edward Alexander was ordained to the Catholic priesthood in 1996. During that time he wrote a newsletter and hosted a talk show programme, "Christ Alive" on DBS Radio. He conducted the choir at the Cathedral of Our Lady of Fair Haven. Edward loved music, said his sister Amoy, and so he taught harmonized singing in the various choirs that he worked with. In later years, he was the keyboardist of the Gregorian Choir which specialized in Latin chants, hymns and masses. Alexander went on to the US Virgin Islands in the 1970s and from there moved on to Canada. He was very much involved in recruiting Dominicans in the farm labour in Canada. He married educator Patsy Monelle of San Sauveur in Canada. Around that period he left the priesthood. Alexander pursued studies in Ottawa at St Paul's University, the University of Ottawa and Carleton University in communications and animation. He obtained a Bachelor of Arts degree with honours in Communications and the Master of Journalism degree. He pursued a post graduate course in diplomatic studies at Oxford University where he earned a distinction in diplomatic practice. Alexander and family returned to Dominica in the 1990s and received the call for another kind of service, in politics. He was unsuccessful as a contestant at the 1995 general elections on a United Workers Party (UWP) ticket for the Colihaut constituency. The UWP however won that election and Alexander was appointed advisor to then Prime Minister Edison James. Davidson Bruney who was UWP's senior information officer said Alexander, the media man, was about getting it right and being accurate in the stories he disseminated. Bruney adds that it was unfortunate that Alexander's skills were not used at the highest level in the training of young media practitioners. Bruney also noted that Alexander's training in diplomacy and international protocol also assisted in the smooth entry of the UWP in government. He was a stabilizing force within the government because of his desire to get things right. With the change of government in 2000, Alexander became the editor of Tropical Star for two years before moving to Haiti for a few years on a CARICOM appointment. When he returned to Dominica, he also pursued his Catholic faith with vigour and would find himself in different parishes playing at Eucharistic celebrations where there were no musicians. He was a devoted Catholic. Amoy Williams described her brother as being part of a close family unit. "We all loved our brother. We are very proud of him. He was a loving person and loved by lots Dominicans, his people in whatever he was involved in. He was just a good person." Alexander's body was expected to arrive in Dominica on Tuesday, June 4; the funeral is scheduled for June 7. May you rest in peace, faithful servant.